It's Saturday morning here and I realize it's been a few days since I've posted anything. Thursday evening we went out for supper. Several people had mentioned that a new Chinese restaurant just below the hospital had good momos (Tibetan dumplings). So we decided to try it. We weren't in the mood for momos, so we decided to try some of their Chinese food. Not such a good idea... We had "Americal Chopsy" (American chop suey, supposedly) and some chili potatoes. The former turned out to be very thick, gelatinous and dark red. It may have had some vegetables in it. We managed to eat a bit with some rice. The chili potatoes were edible, just not as good as some we've had. (French fries in a bit of hot sauce) I had forgotten to bring my phone, so no pictures, sorry. We enjoyed looking at the menu while waiting for our food. We didn't have dessert, but thought the Banan Filter might be interesting -- I think it is a banana fritter. 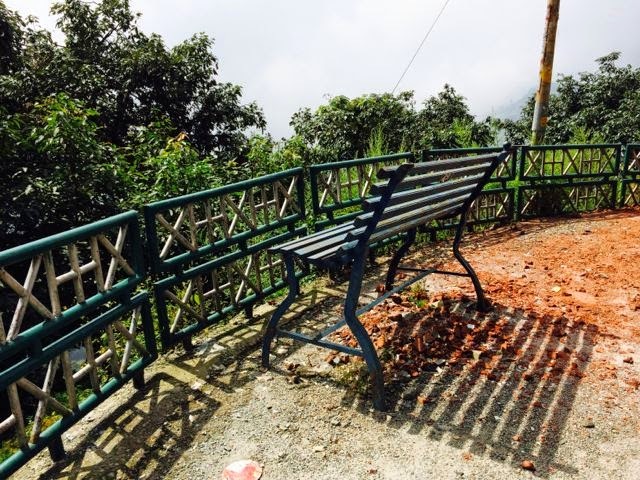 In several spots along Tehri Road, benches have been installed for us to rest and enjoy the view. In this photo you can see the sun is shining brightly, but there is cloud obscuring all the view. 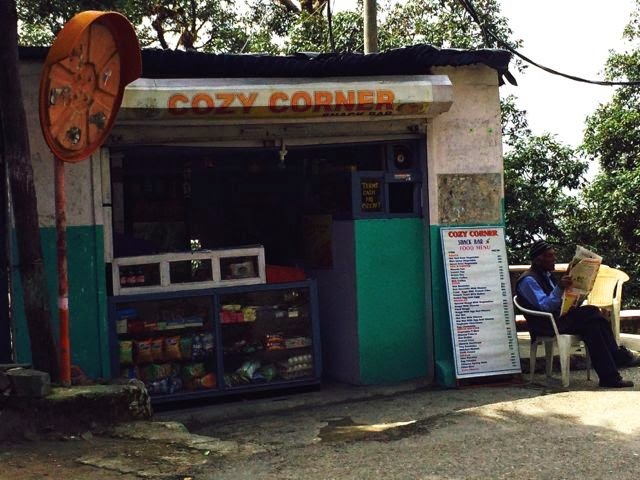 Cozy Corner, just below Woodstock Villa, is a favorite student hangout. For such a small place, they have quite an extensive menu of snacks. Unfortunately, the mirror here that helps oncoming traffic see around the corner has been broken and/or removed. These mirrors are extremely helpful to drivers and even to walkers. The pushta (retaining wall) above the main gate of the school has lovely gardens. 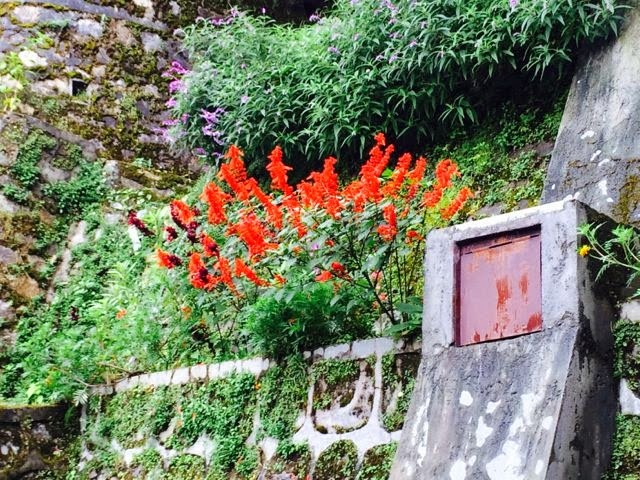 These bright red flowers certainly cheer up the hillside. After supper on Thursday we stopped at the subzi wallah and picked up a few vegetables. My Friday night supper was a sort of frittata. 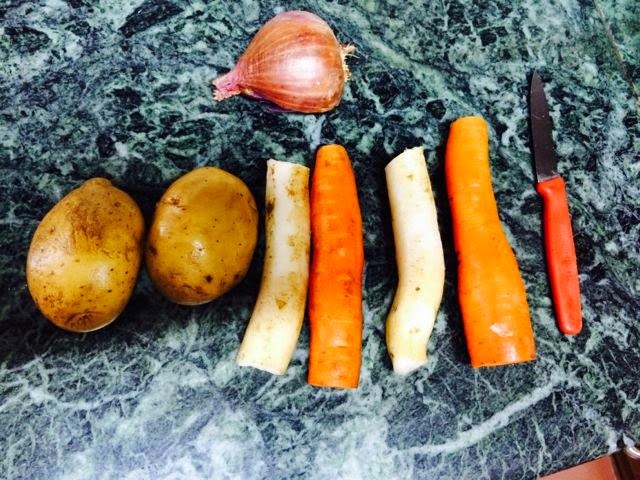 I took two potatoes, two carrots and a long parsnip to start with. The carrots were covered with mud but they cleaned up all right. I cut them all into small pieces and boiled them for about 15 minutes or a bit longer. Then I sautéed chopped onion and garlic in some butter, added half the cooked veggies and cooked them all for a while in a small frying pan. I chopped up some cheese (no grater) and mixed it with three eggs. I then poured it all over the veggies and put on the lid. It turned out really good! Dan went down to the dining room to get some salt in a cup, as we didn't have any and this dish definitely needed some. It was a nice change from our usual soup. And half the veggies are left for another day.